It’s not hard to understand why some of the world’s largest corporations have made huge investments in metal 3-D printing recently. Manufacturing metal parts at scale currently requires companies to navigate complex global supply chains that take an unavoidable chunk out of the bottom line. However, the cost, complexity, and time associated with metal 3-D printing has ensured the technology’s mark on the multi-trillion-dollar manufacturing industry remains minimal. Desktop Metal is working to change that. Later this year, the company will begin shipping early versions of its Production System, a 3-D printer that can produce up to 100,000 metal parts at a cost and speed competitive with traditional manufacturing methods. The company’s first product, the Studio System, improved the safety, speed, and price point of 3-D printing prototypes and small batches of metal parts. 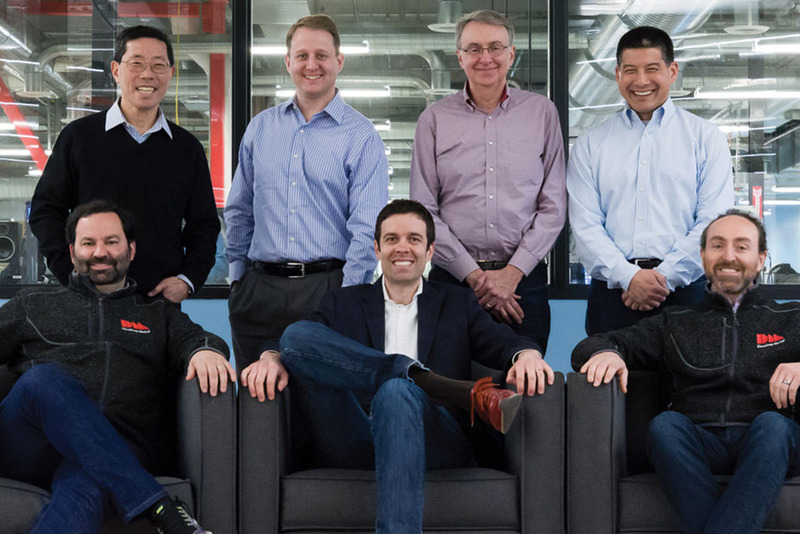 In pursuit of that goal, the founding team, which includes four current MIT professors and an alumnus of the Sloan School of Management, has overseen a remarkable degree of innovation that’s led the company to file or be in the process of filing over 200 patents. That innovation may help explain why Desktop Metal has enjoyed an unprecedented trajectory since its founding in 2015. The Boston Business Journal reports that last summer it became the fastest company in U.S. history to reach a billion-dollar valuation, on its way to raising $277 million in venture capital. The centuries-old manufacturing industry may seem like a formidable target for such a young startup, but the investing arms of corporate behemoths such as Google, Ford, BMW, and GE have funded Desktop Metal in bets that the company can disrupt the industry at a scale never before seen in the 3-D printing world. In 2012, Ric Fulop MBA ’06 was a general partner at North Bridge Venture Partners when he saw a business opportunity in the fact that current processes for 3-D printing metal were far too slow for mass production and far too expensive for prototyping. He spent the next three years looking for the right company to tackle those problems before deciding that he should start the company himself. Recognizing the enormous technical challenges ahead of him, Fulop decided to bring together a team of people who have spent their careers advancing fields related to 3-D printing, including materials science, machine design, automation, and software. The six people with whom he founded the company include Hart; Kyocera Professor of Materials Science and Engineering Yet-Ming Chiang; materials science and engineering Professor Christopher Schuh; and mechanical engineering Professor Ely Sachs, an early pioneer of 3-D printing who invented the widely used method of binder jet printing. The other co-founders are computer-aided-design software veteran Rick Chin, and Jonah Myerberg, who worked with Fulop at a previous company and currently serves as Desktop Metal’s chief technology officer. Among the team’s breakthroughs was a printing technique called bound metal deposition, which works by extruding metal powder mixed with a binding agent, in a similar fashion to the layer-by-layer process that’s common in plastic 3-D printing. The parts are then placed in a debinder, where a proprietary fluid dissolves the binding agent, before they are sintered and densified in a furnace. Bound metal deposition works with many of the same alloys as the metal injection molding (MIM) process that has been widely used in manufacturing since the 1980s, including stainless steel, copper, and titanium. The Studio System made 3-D printing practical for office prototyping and low-volume production. But in order for Desktop Metal to contend with the global manufacturing market, the company needed to further reinvent the printing process. The firm’s Production System leverages another proprietary technique called single pass jetting, a complex but outwardly smooth process in which a print head with powder spreading units on either side slides back and forth across a build area. With each pass, the printer deposits precise layers of metal powder before jetting a binding agent onto the powder. Each layer of powder is as thin as a human hair. According to the company, the system is the world’s fastest metal 3-D printer, 400 percent faster than the closest binder jet system and 100 times faster than today’s laser printers. Fulop estimates that two dozen Production Systems will be shipped in 2019 as the company continues to scale. With orders rolling in, many of Desktop Metal’s customers are looking to purchase multiple systems to print at volumes much higher than 100,000 parts. Still, it remains unclear how much 3-D printing will be disrupting mainstream metal processing in the near future. Traditional manufacturing processes, like casting, do have their advantages for creating relatively simple parts at high volumes. Measuring the impact of metal 3-D printing using the sales volume of current machines and materials probably underestimates its true value. The unique capabilities of 3-D printing should uncover novel options for engineers and designers trying to make objects such as more efficient aircraft engines and lighter automotive structures.